Merry Christmas from Chaos Manor South! That's right, the very merriest Christmas to you and yours from the denizens of Chaos Manor South, Uncle Rod, Miss Dorothy, and Miss Beth (home for the holidays from Yankeeland). Unfortunately it's a rainy Christmas Eve way down here in the heart of the Great Possum Swamp, so our yearly ritual of sipping eggnog fortified with you-know-what while viewing that greatest of all ornaments, M42, is likely to be stymied. I 'speck we'll just adjourn to the corner Mexican restaurant shortly for many margaritas, that being the case. Weather be damned, it will be a wonderful Christmas for us and I hope for all y'all too. I also hope the new year brings, above all, an opportunity for me to spend more non-virtual time with you. Let me, especially, express my thanks to the many of you who have been so nice to me as I've journeyed to your star parties across the good, old USA. You made this broken down old hillbilly feel right at home from Pennsylvania on the Atlantic to Washington on the Pacific! What do I want for Christmas? Not much. I've pretty much got it all. I'm very lucky to be living my dream, spending much of my time talking about, writing about, and playing about with SCTs and that other astro-gear we love so much, all in the company of the wonderful Miss Dorothy. But it's not and never has been just about the gee-gaws and goodies. The most marvelous part of this game for me (and I hope for you too) is still the wondering at and the sharing of the reason for all of it: the night sky. No, what could I possibly ask for that I don't have? The main thing I have being the friendship of you, my brother and sister amateurs. Well, enough of the sentimental mush, bubbas and bubbettes. If you'll excuse me, looking out the window I see there's a possum waiting for his Christmas Eve dinner out on the deck (no, I'm not kidding). To bed with you, and dreams of Celestrons (and Meades) dance in your heads! Like everybody who's had anything to do with Night Sky (I contributed several articles over the course of its brief lifespan), I've been impressed by what Kelly Beatty and his Skypub colleagues have accomplished, and proud to have had a (very) small part in what looked to be a the success of a new magazine—something pretty rare lately. Not that I'd figgered the magazine had a dog's chance in hell when I first heard about it. When I was told about Sky’s plans for a new beginner magazine, I was just a mite skeptical. It was an idea that had been tried before—most recently by Kalmbach with their Odyssey, which was kept afloat for quite a while, but never really took off. Night Sky, I learned, however, was gonna be different. It wouldn’t be a kid magazine, it would be aimed at amateur astronomy beginners of all ages. It would be "backyard astronomy for everyone," light on the Discovery Magazine type gee-whiz science-fact stuff, and heavy on practical observing how-tos and equipment advice. As one issue after the next hit the streets , each better than the last in my opinion, each garnering, from what I could tell, favorable notice among amateurs old and new, young and old, I began to think the upstart just might make it. Alas, ‘twas obviously not to be. 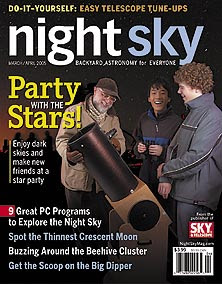 I think Night Sky was a brave experiment for a time when it’s a tough proposition to start a new newsstand magazine (or even keep an existing one afloat). Sadly, sometimes brave experiments fail, however worthy they may be. As above, my hat’s off to Kelly, the Night Sky staff, and my fellow freelance contributors. No happy ending, but what a magnificent failure Night Sky was. Can’t Y’all Just Wait One Cotton-Pickin’ Minute? Yeah, I know everybody’s eyes just positively light up at the thought of a new scope (witness Growltiger’s peepers in the pic at your left). I also know the new breed of inexpensive (relatively speaking) APO refractors from China have got y’all in a dither. But I didn’t expect to get so many anxious questions when I let slip that I was evaluating the William Optics 90mm Megrez APO. Believe me, I’m not trying to keep secrets, folks, just trying to get a chance to use the darned thang. Have y’all looked out the window, lately? If you have, you’ll have noticed that that ol’ Moon has been pretty fat in the couple of weeks since the Megrez arrived at the Hallowed Halls of Chaos Manor South. I haven’t really, truly taken First Light with it yet—oh, sure, I had it out last weekend under the near full Moon, but that doesn’t really count, does it? Still can’t wait to hear what the verdict is on this one? Well, if you just can’t cool your jets till my full review comes out at Uncle Rod’s Corner on the Anacortes Telescope and Wild Bird website, I’ll let you in on my initial impressions, I reckon. The old columns at Uncle Rod's Corner are LONG gone, but you can still read 'em on my Rebel Reviews page. Vital stats: Megrez 90mm air spaced FPL-53 (doublet) objective with STM coatings f/6.9. $1098.00 for the complete package including a nice case and a beautiful diagonal with carbon fiber side-plates. The “bare” OTA is also available. 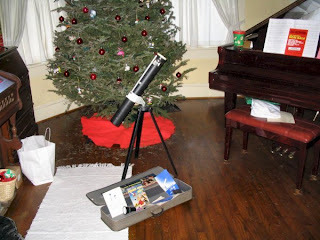 For some of you, a grand seems like big bucks for a 90mm telescope, I know. My advice? Go price a TV85. If you set down and ruminate on the uses a scope like this can be put to (grab ‘n go, imaging, wide field deep sky viewing, guiding, etc., etc.) a thousand simoleons doesn’t seem quite as painful as it might otherwise be. This is a fairly heavy little sucker, about 10 pounds with a wide field eyepiece in place. We’re getting beyond the “grab ‘n go” here, boys and girls. If you choose, as I did, to mount it on a medium-weight go-to GEM , I guess you could pick the whole shebang up and carry it into the backyard, but you’d have to be a lot less broken-down than I am. On the other hand, placing the scope on an alt-azimuth mount like the WO EZ-Touch (http://www.buytelescopes.com/product.asp?t=&pid=10370&m=49) might make for just the sort of git-up-and-git-out rig you’ve been dreaming about. Even then, this heavy-duty scope will still be something of a handful, but that’s the price you gotta pay for quality and—usefulness. IMHO, you really want at least a 90mm refractor or 100mm reflector to make your grab ‘n going worthwhile. Why bother to trot a scope of any kind out if you ain’t gonna see nuttin'? How are the optics? That’s always the question, ain’t it? While I didn’t have many purty things to look at, there being a just-past-full Moon staring down at me, I was able to gauge the scope’s color-handling characteristics. I was impressed. With the thing pointed at the near-full Moon and my eye off axis, I could detect a subtle yellowish line along the Lunar limb, yeah, but I was never sure this was in the scope, the eyepiece, or my eyes. Vega was perfect in focus and I didn’t notice much—if anything—in the way of funny colors on either side of focus, either. Star test? A front was blowing through, making it hard to quantify the objective’s correction, but from what I could tell, it looks…sweet. 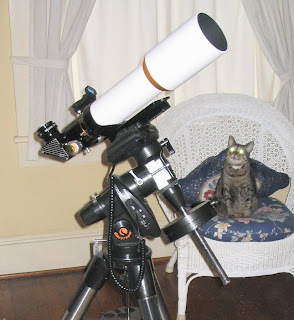 Yeah, I love my CATs, but I must admit that, yeah, the teeny-tiny stars in this APO refractor are something to see. The mechanics? The tube is heavy-duty, the focuser (one of WO’s two-speed jobs) is heavy-duty, even the dew shield is heavy-duty. Looking down the business end, I noted a subtle purplish reflection when I performed the dreaded flashlight test. In room light? The objective seems almost to not be there. The tube baffles are real baffles, by the way, nice knife-edge jobs. Folks, it’s been a long time since William Optics used the foam baffles they experimented with for one of their initial scopes, the li’l 80mm Megrez “Short Tube 80 Killer” of yore. IMHO, optically and mechanically, WO is on a par with the big boys now. What do you need for a mounting? At just under f/7, the scope is not overly demanding despite its robust construction. Don’t think you’ll put it on an EQ-1 or your mama’s K-Mart photo tripod, though. I found the Celestron CG5 to be “bout right.” On this mount, the scope is provided with both a sturdy platform and go-to capabilities. Do you need a finder? Yes, this is a wide-angle scope as such things go, but you’ll still want a finder, even if all you need to do is point at go-to alignment stars. I’ve lined-up scopes in this aperture/fl range without a finder, but I can tell you that having a decent finder will cut down on your cussin’. WO doesn’t provide a finder with the scope, so you’ll need to choose one you think appropriate (you’ll probably want to use one of their finder brackets in order to not have to do any mechanical messing around). My choice? One of the new Chinese red-dot sights, one of the ones with the switchable reticles (see Eric Gage’s excellent review of these next-generation BB gun finders at http://www.astromart.com/articles/article.asp?article_id=501) . These sights, all identical, are available from WO and other sources. I think one of 'em looks purty dern cool on the 90. How do you get the consarned telescope onto your mount? It does come with a ¼ 20 mounting bracket, but that’s clearly insufficient for astronomical use. You’ll want to bolt the scope’s little footsie (which is an integral part of the focuser/rear assembly) to a good dovetail bracket via ¼ 20 tpi bolts. I used a WO Vixen-format dovetail (built like a tank). As you can see in the image (click it for the full-size picture), this arrangement leaves the scope front end kinda hanging out there in space. WO, in the manual that came with the 90, suggests you support the front end with a 90mm tube ring screwed to the forward portion of the dovetail. In reality? I Didn’t need it. With the scope bolted to the dovetail as in the picture above, there was no flexure that I could see, and the vibrations induced by your Uncle givin’ the scope a good hard finger-thunk (like he used to do to the back of the head of that cute girl, Debbie, who sat in front of him in 6th grade) died out in a second or less (with the scope on the CG5). That's all for now, but stay tuned. There'll probably be one more report here before the full-fledged review goes up. What’s next? My next move is to hook a CCD camera to this purty scope and see what she’ll do.